Video glasses haven't exactly taken off, partly because of all the wires involved. Today, I learned about the Qingbar GP300, billed as the "world's first wireless video glasses" featuring a QVGA video image (432x240) that simulates a 50" display from 2M away. It sports a built-in media player that'll play your favorite movies, videos, MP3 music, photos and even e-book text using its built-in SD slot. It's play several video formats including MP4/MPG/AVI/ASF(MPEG1/2/4) and most importantly Divx3.x/4.x/5.x & XviD. Portable wireless video glasses are cool, but it's too bad you have to download the media content to an SD card in order to play it. I'd rather the device support Bluetooth or WiFi and wirelessly stream content from my PC. Even better, "if" it could stream the "actual" video screen pixels of your PC (think PCAnywhere or Microsoft Remote Desktop/RDP Protocol) then you could play with your XBox 360 or PS3 with this bad boy. I also wish it had a microphone and a camera. Then you could do some Skyping/VoIPing and webcamming. Of course, the camera would have to be aimed away from your forehead, else the remote webcam party is going to get a shot of your forehead. 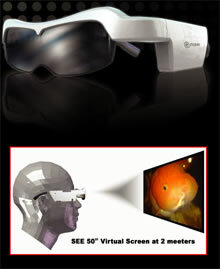 Still, a cool pair of video glasses that might be great for travel. They're shipping at the beginning of December of this year for $399, with pre-order going for just $299. \nVideo glasses haven't exactly taken off, partly because of all the wires involved. 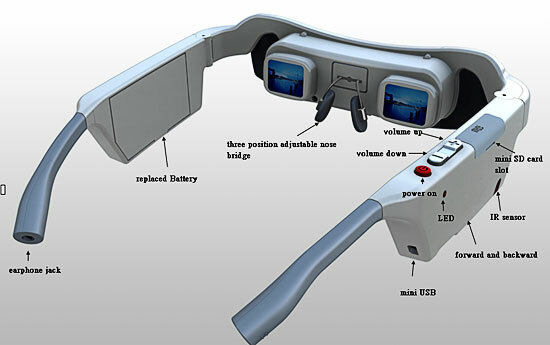 Today, I learned about the Qingbar GP300, billed as the "world's first wireless video glasses" featuring a QVGA video image (432x240) that simulates a 50" display from 2M away. It sports a built-in media player that'll play your favorite movies, videos, MP3 music, photos and even e-book text using its built-in SD slot. It's play several video formats including MP4/MPG/AVI/ASF(MPEG1/2/4) and most importantly Divx3.x/4.x/5.x & XviD. \nPortable wireless video glasses are cool, but it's too bad you have to download the media content to an SD card in order to play it. I'd rather the device support Bluetooth or WiFi and wirelessly stream content from my PC. Even better, "if" it could stream the "actual" video screen pixels of your PC (think PCAnywhere or Microsoft Remote Desktop/RDP Protocol) then you could play with your XBox 360 or PS3 with this bad boy. \nI also wish it had a microphone and a camera. Then you could do some Skyping/VoIPing and webcamming. Of course, the camera would have to be aimed away from your forehead, else the remote webcam party is going to get a shot of your forehead. \nStill, a cool pair of video glasses that might be great for travel. They're shipping at the beginning of December of this year for \$399, with pre-order going for just \$299.